It is a cool and sunny Saturday afternoon when I arrive at Kerr Park in Oklahoma City. The park is nestled between Robinson and Broadway off Robert S. Kerr Ave. It is surrounded by tall office buildings that define downtown Oklahoma City’s skyline. I’ve been to this park before it was transformed into a small city unto itself. I hardly recognize this space as I walk towards the park’s plaza with my two daughters in tow. For the record, I’m single-parenting this weekend as my husband is out of town for his monthly National Guard weekend. My children are skeptical of this situation and not happy that I have dragged them out to one of my reporting assignments. They complain that they will have nothing to do as I go about interviewing the people who have gathered to protest against Wall Street, laws that enable corporations to have the same rights as citizens, and a whole slew of other complaints directed at those responsible for the economic collapse that hit fever pitch in 2008 and resulted in corporate bailouts paid for by American taxpayers. Apparently when you are a 9-year-old and a 7-year-old, financial crises and political protests are not as entertaining as finding someone to play with or a game to join. At any rate, the children are taking in the sights and sounds with me. Cars with drivers sympathetic to Occupy OKC’s cause honk repeatedly as they pass by the park. I’m surprised that the honking is as frequent as it is. In turn, the Occupy OKC protestors wave their signs and send out rallying cries. Incidentally, that Saturday is the day organizers have dubbed Stand in Solidarity Day. We come to an information table where fliers range from leaflets about protest musicians who are performing to fliers about the guiding principles of effective grassroots movements. Past the information table is the “kitchen.” Participants and people sympathetic to the cause have donated drinks, food, and a variety of other things to the movement. The kitchen takes up a fair amount of space, but then again Occupy OKC Official has occupied Kerr Park for a week. By now, my daughters have found the kids’ station and leave me to explore the hula-hoops, games and chalk. I come across an agenda written on poster board and taped to a street lamp. I’ve heard mainstream media mock the entire Occupy movement for its lack of focus, but evidence of a daily agenda would suggest the people occupying Kerr Park are working towards productive actions. Around this time I recognize a former OKC.net editor and writer, Liz Drew. She agrees to sit down with me and provide more insight. We grab a free black Chai from a carafe at the kitchen and move towards the tents, which are located on the upper level of the park. Drew said the movement started online through networking sites like Facebook, and despite the deletion of original Occupy OKC Facebook page by some unknown entity – hence the slight name change – interested citizens began holding meetings at Will Rogers Park. 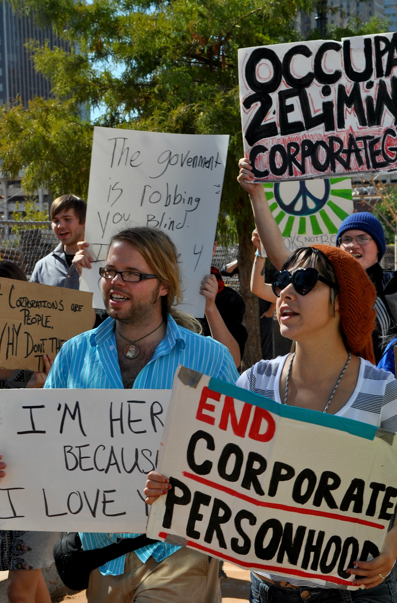 On October 7th Occupy OKC Official held its first General Assembly. On October 10th the group began occupying Kerr Park. On October 11th the movement held its first march through downtown Oklahoma City, and this past Friday, October 14th, Occupy OKC Official marched to Chase Bank. Drew said protestors carried signs through the underground walking tunnels and although the march was silent, it elicited an angry response from bankers and employees in the building whom allegedly shouted at the protestors. To date, no one in the Occupy OKC movement has been arrested for protesting; Drew said the Oklahoma City Police Department told organizers their interest is in protecting protestors from angry citizens. I spoke with Jay Andrew Vehige, another organizer of the event. Vehige said the group marched towards the Myriad Botanical Gardens re-opening ceremony earlier that morning, but were turned away by the OKCPD, who informed organizers they were not allowed to occupy the sidewalk near the gardens. The group returned without further incident. But later, as planned, Occupy OKC Official conducted another march towards the Deep Deuce, this time being successful. Who is funding the movement? In order to legally assemble in Kerr Park, Occupy OKC Official had to purchase permits. But there are other expenses associated in running a movement such as this one. Drew said Occupy OKC Official is only accepting financial contributions from individuals, therefore a small business owner or anyone else affiliated with an organization cannot donate as that entity. Are there internal disputes as to what kind of actions they should be involved in as a group? And although there is no central leadership, the agenda helps keep everyone on the same page. Vehige said during one of their agenda meetings a woman did not like the idea of marching to Chase Bank using the underground walking tunnels. She was concerned it would negatively affect their permits. And therein lies one of the ideological issues Occupy OKC Official will need to resolve as participants move from symbolism to action. But still the occupation remains a peaceful one. To provide a supportive atmosphere, there is another tent known as the Compassion and Spirituality station, which shares space with the Medical station. One side provides first aid and the other gives participants a place to vent their frustrations, meditate or pray. On Saturday Heidi Owens is handling the compassion and spirituality side. It seems idyllic, but does it mean there hasn’t been trouble? Owens said one morning she came upon newcomers who literally set up their tents in the middle of the night. They did not respond favorably to the morning check-in and were hostile with Owens. 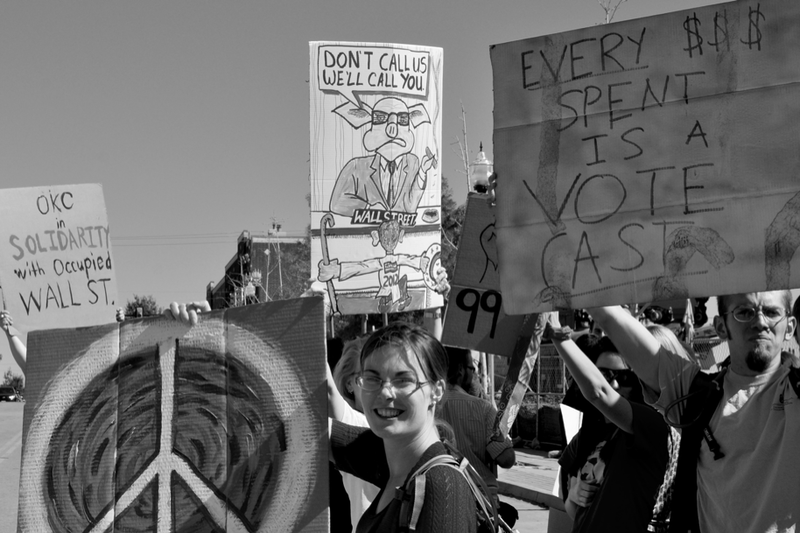 To the credit of others, she said that Occupy OKC participants came upon the scene and reinforced that the movement was a peaceful one and that confrontational and hostile attitudes were out of place. In the end, the newcomers left Kerr Park. Even so, a variety of people are involved with the movement. I met a homeless man, JJ Thompson, who had been out of jail for three months and is waiting on SSI to kick in – a process he started three weeks ago. He only spent one night with Occupy OKC and said he may return. When last I saw him he was making a sign, but there are others here who hold jobs. Some protestors are employed full-time, while others in the movement can only find part-time employment. Ages range from college students to grandparents. Owens, who said she is 40, feels inspired by the younger generation. She said they go off to work or to classes, yet return to Kerr Park to volunteer in work groups, give speeches and march; in the down time they study. 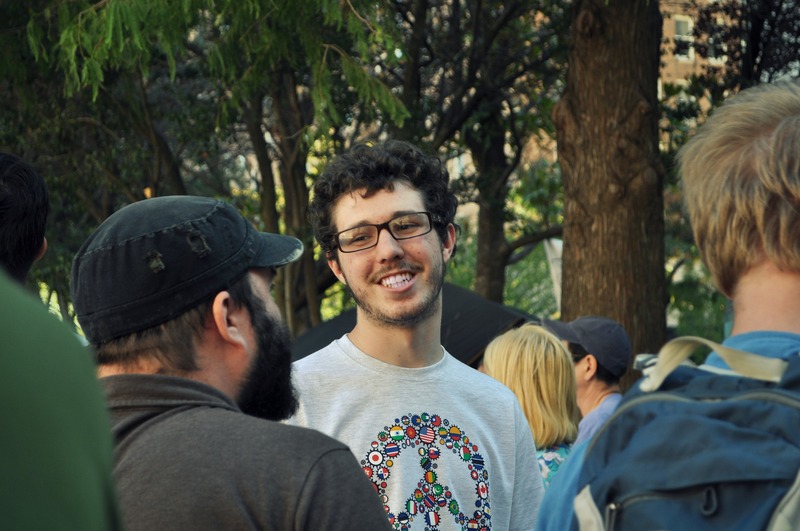 Poet Zakk Flash, who organizes Occupy Norman/University of Oklahoma, said many ideological types are found within the Occupy OKC Official movement from anarchists and socialists to liberals and conservatives. By the time I’ve interviewed Guest, who tells me about the different teams from the infrastructure team to the actions agenda team and what each does for the movement, I find myself watching it all put into motion. It may not be perfect or free of conflict, but I observe people cleaning up the camp. The trashcans are full, but there’s no litter on the streets. There are port-a-potties. And make no mistake: they stink. When I originally arrived on the scene I’d been hoping to report back that there was no incense burning, but in the Counseling and Spirituality station there is a spicy aroma wafting through the tent. As well there should be, the port-a-potties are not far enough away. Also being carried on the breeze? The sound of children running around and people playing various instruments. If it weren’t for the political overtone – the honking, the signs, the rallying cries – Kerr Park would seem inhabited by a bunch of families and friends. Come 4 p.m., I decide it is time to leave and that I’ve gathered enough material to write an article. Ideally I would have found bankers and police to interview, but it seems I will need to return on a weekday and make a few calls to official channels in the interim. My daughters, by this point, have made friends and on our way back to our car they ask me if we will come back tomorrow. They also want to know why everybody is protesting. As I explain in simple terms what happened in 2008 to the present time, I have an odd sensation that I am the narrator of a fairy tale, only I don’t know how this one will end. Will the Occupy movements being held nationally and globally enact change? Or, will the corporations responsible for the shadow cast over our financial landscape continue to operate with even less transparency and have even more political clout than a real flesh and blood person? This is where we leave off our story for now, but it’s hard to say what the end result will be. Editor’s note: The title of this article “The Revolution Will Not Be Televised So Keep Yourself Informed” comes from an Occupy OKC flier. Tagged Chase Bank, Deep Deuce, General Assembly, Jay Andrew Vehige, Kerr Park, Lawyer Jay Treenary, Liz Drew, Myriad Botanical Gardens, Oklahoma City, Poet Zakk Flash, space, SSI, Wall Street Sales Tax. Bookmark the permalink.